Fuzzy GloDice for your car. Cool fuzzy dice that light up at night! 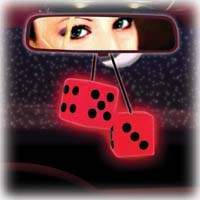 Your car is not complete until you have our Fuzzy GloDice hanging in your rear-view mirror! They look just like regular fuzzy dice, but with a flip of a switch, they light up with color! Each pair comes with a Plug-in cigarette lighter adapter that features a switch for ease of operation. PlasmaGlow Glodice are the perfect addition to any vehicle, old or new! Available in 4 colors! All necessary instructions and hardware are included to ensure a smooth installation. Fuzzy GloDice are backed up with the PlasmaGlow Liftime Warranty. $24.99USDOn Special! This week only! Hurry! Fuzzy GloDice- Back to Home Page.